Well, I survived the collection and processing stages of implementing the GTD Methodology and along the way I made a note of five top tips that I would like to share with you on the Processing section of the GTD Methodology. 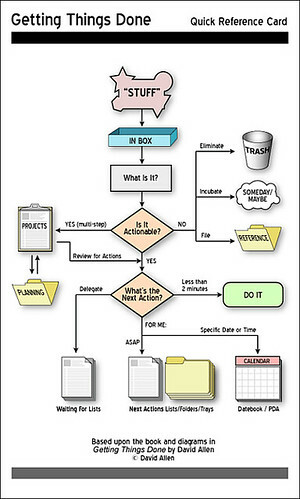 I am presuming you have read my post on Processing, Getting In to Empty, where I explain that processing is where you take the stuff you have collected and implement the GTD Methodology based upon the GTD Workflow flowchart. If you haven’t read it, go ahead and read that post now. Right, so you should be up to speed with where I am with this. I have now five little snippets that I consider useful enough to share in this blog. OK, the first item on my list is to REALLY clear your diary. The GTD book states this is important and I cannot re-iterate just how important this is. I cleared two days in my diary for the collection and processing phase and I am happy I did. Once I had started collection, my office and working space looked like a bomb site. This seemed to add quite a bit of pressure to my process and stressed me out somewhat. I guess this made the processing section a great deal easier and I felt a great relief when it was all done. This entry was posted in General Items, GTD General, GTD, My Review on April 23, 2007 by Andrew Mason. There is a great post over at Lifehack.org about using Gmail and Gcal to take charge of your daily tasks and to do lists. There are a million tools out there to keep track of your tasks, your appointments, your emails and reminders. But letâ€™s face it â€” each of them have their drawbacks, and finding the right combination can be an ongoing quest. Many people also love Gmail and Gcal as two of their online tools of choice – theyâ€™re simple tools that get the job done fast, wherever and whenever you need them. If you count yourself among this group, hereâ€™s a guide for using the Gmail/Gcal combination as your online information center. Follow THIS LINK in order to check out the article. Well worth a read, especially if you use, or are thinking to use the Google applications as your chosen method to implement a GTD system. This entry was posted in General Items, GTD General on April 22, 2007 by Andrew Mason. After reading the great blog entry titled “How to Make a GTD System for Around $20” over at Cranking Widgets, I decided to add a UK spin to this theme as I am based in the UK and I have quite a few UK based readers. The Cranking Widgets blog entry takes you through building a complete GTD system for a super cheap $20. The core component is obviously the GTD Book from David Allen but after that they take you through other essential items and provide online links of where to get them. This is great if you are in the US, but how about our UK readers? Well, with the conversion rate between the UKP and USD so strong, in the UKP favor, I am trying to do the same as Cranking Widgets, but for a measly Â£10. This works out at around $19 for a GTD system. This entry was posted in General Items, GTD General on April 17, 2007 by Andrew Mason. Well, I thought it was about time to write the next installment in my journey to stress free productivity utilizing the GTD system. Hopefully, you will already have read my previous posts on Getting Started, and also my “stuff” Collection Day. Well, as stated in the collection day post, I collected rather a lot of stuff. I had two storage crates full of stuff that needed to be processed. As I had allocated the time in my busy schedule to perform this task, I had no excuse so I got my waste paper bin ready, got a few black rubbish sacks and made a start. I must admit that the task at hand was slightly overwhelming. My nice and neat place of work had turned into a bomb site. The emails kept coming in, the work was mounting up, and my usually tidy place of work was turned upside down. I must admit, my office is not the largest and having this amount of chaos within it did a good job of increasing my stress levels! It was time to focus and also this was more of a reason to get the processing done, so my office would be back to normal. This entry was posted in General Items, GTD General, GTD, My Review on April 16, 2007 by Andrew Mason. Just caught this podcast via 43Folders.com. For those of you who are not using Mac’s, or those of you who use Mac’s and don’t watch MacBreak, you may not be familiar with Leo Laporte. Leo hosts Mac Break that also features the GTD Guru, Merlin Mann. Leo also has a weekly Podcast called the Tech Guy.Â Well, issue 339 of the Tech Guy Podcast has Leo and Merlin Mann explaining the basics of Getting Things Done. The Podcast can be downloaded direct here. This is quite a long podcast and the section with Merlin Mann and Leo Laporte talking about GTD is 00:59:30 to about 1:08:45. Check it out! This entry was posted in General Items, GTD General on April 9, 2007 by Andrew Mason. I found out about iGTD from reading the download of the day link from Lifehacker. Sounds good so I have added this as a task to my @computer task list! iGTD is a Mac OS X application for implementing the Getting Things Done methodology from David Allen.Â It is a very nice looking application that also integrates with Quicksilver. Merlin Mann over at 43folders.com also has good things to say about iGTD. This entry was posted in Cool Software, General Items, GTD General on April 8, 2007 by Andrew Mason. Getting Things Done in Sixty Seconds! Just returned back after three days in Amsterdam on an affiliate marketing event and also a weeks holiday to Northumberland, UK. Back to it with the GTD posts now. Anyway, quickly, before my next post on my GTD journey I have found a link to a “Getting Things Done in 60 Seconds”, which is a brief overview of the GTD methodology from David Allen. 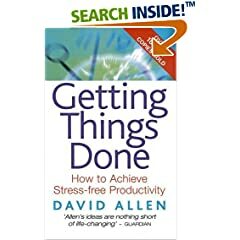 If you’re like most educated technical types, you’ve heard of David Allen’s “Getting Things Done” (GTD) productivity concepts, but don’t use them. And I think I know why: 1) you’re too busy to study a whole book on productivity; 2) it might not work for you anyway; and 3) deep down you really don’t want to change how you work. I’ll make a deal with you. I’ll spend the next 60 seconds telling you how to radically boost your productivity. In exchange, you have to promise to buy the book “Getting Things Done,” if it works for you. I’m not here to steal from David Allen, but to introduce him to you. The concepts below were inspired by GTD, and might be considered blaspheme by GTD fundamentalists — they’re what I started doing after I read two of his books, and they work for me. This entry was posted in General Items, GTD General on April 7, 2007 by Andrew Mason.